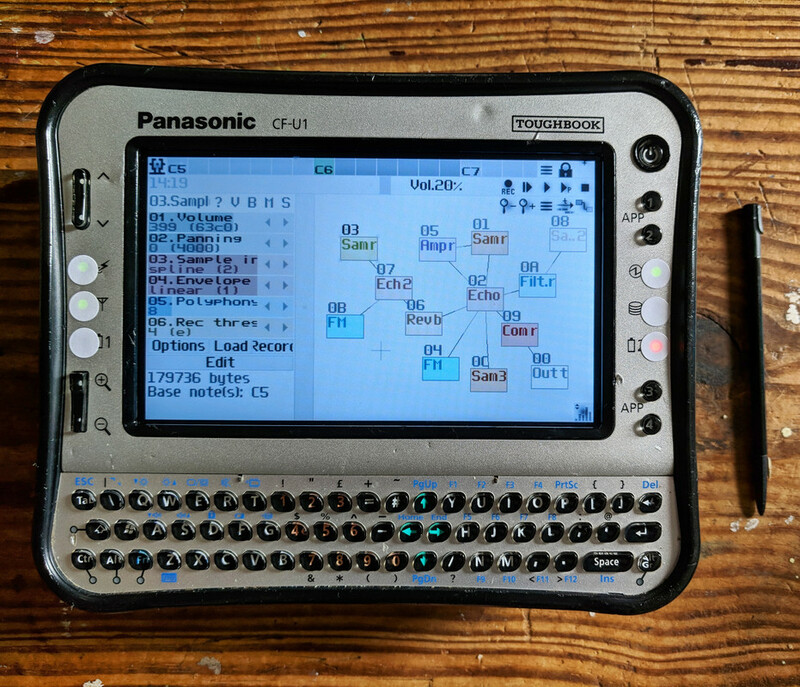 I like portable devices with qwerty keyboards to play with Sunvox on and my latest acquisition along those lines is the Panasonic Toughbook CF-U1... I picked one up for £30 on eBay. I whacked Windows 10 on it and Sunvox works great, but other things like web browsing or videos just makes it grind to a halt. It's got a super slow single core early Atom processor, so yeah... I have tried a couple of lightweight Linux distros, which ran much quicker than Windows 10, but Sunvox was kinda glitchy (not in a good way) and calibrating the touchscreen wasn't working out so well for me. I like the idea of Linux, but coming from a Windows background in the end Linux always seems like more hassle than it's worth... So yeah sticking with Windows 10 for now and just using it for Sunvoxing... I will maybe replace the incredibly slow hard drive with a faster one day, which there are tutorials of online. I have found that Sunvox will allow me to map the weird extra buttons on either side of the screen to do what I want within Sunvox, so that's pretty cool, cos windows doesn't recognise them for anything else. So yep, that's what I'm doing for fun at the moment and even enjoying playing those tiny keys! Kinda weird, but I've mapped the major keys to the left side of the arrow keys and the minor keys to the right. I came close to snagging on of these. The Fujitsu U820 I currently use as my main 'non-internet' computer is about the same power with the main slowdown being RAM. How much RAM does your machine have and can it be upgraded? The U820 is stuck forever with a soldered-to-the-board 1GB RAM chip, which is basically what kills internet performance overall...the average web browser uses about 300MB per tab on even the simplest of text these days...using older versions of browsers can mitigate this, however, as would using older versions of windows. I personally am using 7, though soon I might downgrade to XP as I'm personally not really interested in many new softs and Sunvox continues to be compatible with XP afaik. It will free up some RAM and possibly boost Sunvox performance a bit. I considered the U820 a while ago and probably would have got one by now if one had come along. I'm away from home for a bit in Orkney and am traveling light. I considered bringing the UF-C1 but in the end brought my iPad Mini4 as it can do more than just Sunvox and is also useful to my wife and toddler. So I won't have it to hand for a couple of weeks to check stuff out. It has just 1GB of ram and I don't think it can be upgraded, but I've not looked into it yet. I've heard Win7 is not good on the UF-C1 which is why I went for Win10 (which I'd read ran smoother), but I may also try WinXP sometime. The reason I haven't tried it already is that it's always more work with installing drivers. Win7 and 10 can install a lot of drivers you need automatically. I like the way the keyboard feels on it when playing Sunvox, but they are just tiny buttons, so it won't be to everyone's taste. Yeah I've been playing it with my fingers easily, as it's bigger across than a small thumb style keyboard. The keys backlight as well which is handy. I can upload some more photos when I get home. The resolution is 1024 by 600 (I think). I'll have to get back to you about the other stuff when I get home, but I think there is no graphics acceleration. Someone should make a netbook sized high power laptop with the panasonic toughbook style casing. Maybe with a full sized keyboard that can fold out somehow when its opened up. I think Toughbooks are still being made and they run sunvox fine and you can snag them cheap off Ebay. Sunvox has relatively low overhead for processing requirements (though it has become a little heavier as of late). The fact you can run versions of it on a Palm Pilot speaks volumes; they were very simple portable 68k clones running at 200-400mhz which is nothing. Battery life, though, is always going to be hit the more you stress the processor. It's one reason why I wish there were better OS choices for portable/laptop devices; simply leaving the chipset to deal with bloated legacy desktop garbage hasn't resulted in what should've happened years ago: a useful portable device that can run 40+ hours.